Remind yourself to always use David Miscavige's real name when you are calling him names or saying something derogatory. It will help Google with correctly indexing him. Oh, and did I say David Miscavige is a small midget? Presently Flag has a 4.4 rating (out of 5). Given that the Church of Scientology claims to have 12 million members it's a bit odd that only 76 of them have given a rating to Flag on Facebook, which has a global rank of #2 for internet traffic. Where's the other 11,999,924 members? I figured that we could assist them by posting some reviews there ourselves. I posted a comment in response to someone's review and it disappeared in a few minutes. Is this a moderated page? It's a good thing I saved a copy of my comment above. It's gone now off Facebook. Since my comment on FB got nuked and I saved a screen shot of it which I posted in the OP, I figured I'd post a link to my thread for any Facebook readers who may be interested. We'll see how long THIS stays up. Also, it's the apex service org. I got the hell out of there and never did another service anywhere. 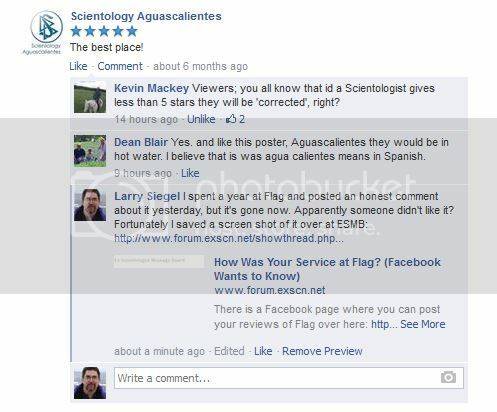 Flag was my exodus to Scientology...I'm only sorry I never went sooner because up to then I believed the Events and thought Scientology was expanding... just not in the regions I was familiar with...I thought Out-Int Management had a grasp on reality. After experiencing the tech Mecca I knew there was no hope. Flag was totally and only concerned about Flag and the fact that there were customers there was merely dev-t. Yes what you say is true. It's kinda like when you go to the examiner after an auditing action or course. If you don't write a rave success story you will end up in the qualifications division or getting a review at more expense. Hubbard had everything worked out so that we were trapped. Die if you do, die if you don't. At least now that we are out we can take an honest critical viewpoint and make a statement. this is part of the scam of Scientology - the "success story"
Posted! 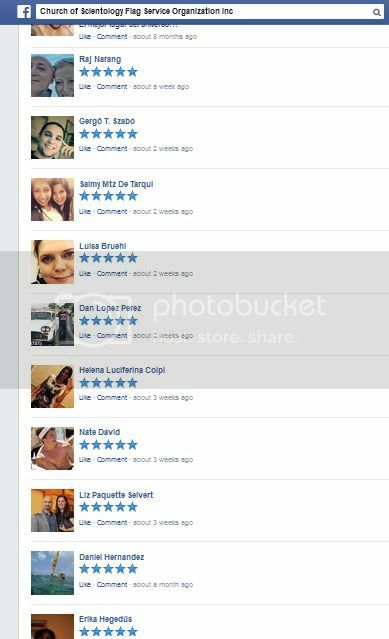 Overall rating at time of posting down to 4. It looks like their rating slipped even further down but within the past month a number of 5 star ratings showed up for them so they are back up to a 4. I went and read some of the reviews and almost spit out my coffee when reading this one. <snip> I went and read some of the reviews and almost spit out my coffee when reading this one. Aaarrrgh! - That's precisely why we freak out!!!! I clicked onto Flag's FB page this morning and it appears they disabled the ratings and reviews for Flag, as I don't see ANY at all. I do see ratings on Yelp though, in case anyone would like to leave one. Have we made mistakes in the past? Well, yes - Wogs call them CRIMES and they go to PRISON for them. I read the entire review that that is excerpted from and it seems completely genuine to me, and something that a scientologist would write. FSO (Flag Service Org) presently has a very good rating on Yelp, 4 1/2 out of 5 star rating. Anyone who has their own experience at Flag is free to leave a rating and review. They've only got 12 reviews there total at Yelp which is kind of surprising given the 12 million scientologists on the planet and Flag is their "mecca". So any reviews those of us who had a bad experience there might leave could have a big impact on their rating. I spent quite a bit of time over there and must say that the Fort Harrison is very nice inside. That said, I wouldn't recommend anyone to do any scientology services within here. To complete all the services which are considered necessary within scientology will set you back a minimum $250,000 but many people end up spending millions, and if you have any money or can get it the registrars will demand it no matter how much you've already given. The bad part though is that you may not resolve the issues you came to handle in the first place, and you might leave with serious issues you didn't arrive with. Bankruptcy, your family all torn apart due to the Disconnection Policy, and more. Watch the TV series on A&E Network produced by former scientologist Leah Remini entitled "Scientology and the Aftermath" if you want to know the truth, and than read Mike Rinder's blog, the former head of Scientology's Office of Special Affairs. I got an email today from Yelp letting me know they removed my review as it contained a violation of their guidelines. (some information that was second hand). A couple other reviews also were removed as they were down to 10 reviews from 13. However, I wouldn't ever recommend anyone to do any scientology services within here. To complete all the services which are considered necessary within scientology will set you back a minimum $250,000 but many people end up spending millions, and if you have any money or can get it the registrars will demand it no matter how much you've already given. I spent about a year there in total and in addition to the above I also observed some of the staff as well as customers being treated in an abusive fashion. You don't think it had to do with OSA reading your post and spewing coffee on their monitors, and burning up the phone lines getting Yelp to ditch the review, do you?